Data is the DNA of marketing. So much of how marketers plan and execute campaigns is built on the very foundation of data. According to Adweek, 88% of marketers aren’t using data to its full potential, yet 71% say it is the most important customer experience factor. Clearly, there is a lot of room for growth when it comes to data-driven marketing. As marketers, when you are considering your data strategy, choosing the right data partner is imperative to your long-term plan. Over the last five years, as the demand for data has increased, so have the options to supply it. We want to help marketers cut through the noise when considering a new data provider. 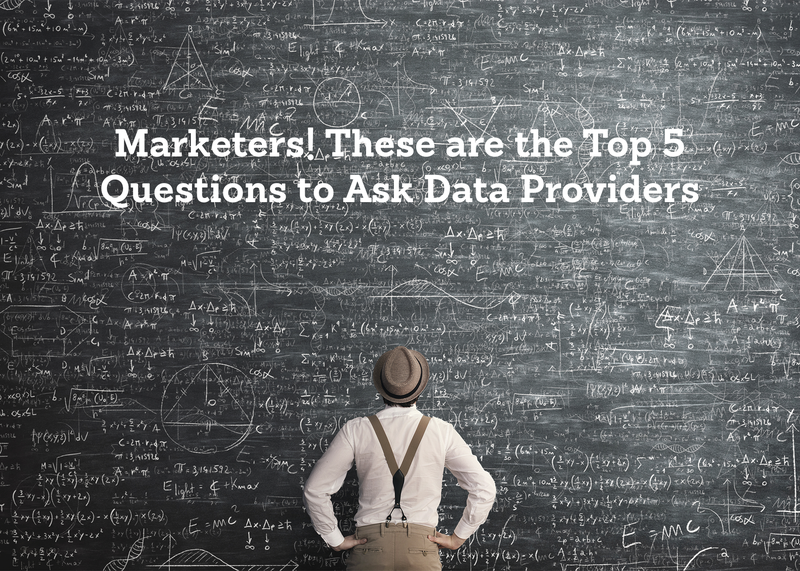 Here are the top five questions we recommend you ask data providers before you sign the line. 1) Where does the data come from, what is the source? What data are you actually buying? You should never buy data if you don’t know where it’s coming from. Most commonly, data comes from three types of sources: first-party data, second-party data and third-party data. Let’s start with third-party data. Third-party data is when you pay a data broker in exchange for data collected by a variety of sources. Like anything, there are pros and cons to using third-party data. With this data you have easy access to a lot of data, however, your competitors may also have access to this same data. Additionally, the quality varies greatly from broker to broker and it often raises questions around consumer privacy. Second-party data is the exchange of data between partners. For example, if ‘Company A’ exchanges their first-party data with ‘Company B’s’ first-party data, this becomes second-party data. Some pros to this data include a better chance at accuracy because it’s from one source. First-party data is your own data used straight from your most valuable source: your customers! This data is often collected from existing marketing campaigns, web analytics platforms, CRM platforms, site forms and emails. The obvious pros to using first-party data is that it is completely unique to your company and FREE. When using first-party data it is important to have knowledgeable staff or a DMP to collect and interpret that first-party data. 2) Do I have to contribute my data? Some data providers require marketers to contribute their data in order to benefit from the larger pool of data. This is called a data cooperative (co-op). As defined by Tech Target, a data co-op is a group organized for sharing pooled data from online consumers between two or more companies. Within a data co-op, members offer relevant marketing data gathered from browsing and purchases of online customers in a jointly accessible “data store”. The benefit of a co-op is the ability for marketers to see customers through a different lens than what is seen within their own first-party data. However, the biggest risk to participating in a data co-op is the availability of the exact same data to your closest competitors. Essentially, you and your peers are likely all building your marketing strategy off the same lists. 3) Which behavioral signals are used for audience segment placement? Today there are many flavors of data used in marketing. Consumers are leaving their footprint online, offline and everywhere in between. It’s important for you to understand which signals your data provider is using to create their audience segments. There is a difference between self-reported data (surveys and demographics) and data captured through a consumer’s actual behavior (transactional, geographic or browsing data). That difference is the difference between what people say and what they actually do. Here is a simple breakdown of the different types of behavioral data you should know about when considering a data partner. Qualitative and Quantitative data are known as siblings in the world of market research techniques. It’s important to know the difference and is typically wise to include both in marketing research efforts. Quantitative data is structured (often numerical) data that can be plugged into a spreadsheet and analyzed with statistical methods. Conversely, qualitative data can be thought of as unstructured information (focus group comments, observations, etc.) that is summarized subjectively, as opposed to mathematically. Transactional data refers to a consumer’s past purchases and can be a great predictor of future behavior. Geofencing is a form of location-based marketing. It refers to a virtual boundary around your business and the targeting of people who are within that perimeter with a special offer or promotion. Hyperlocal refers to the ability of a business to “show up” when local consumers are looking for your products and services; using GPS data to geographically target and provide location-based advertising. Intent data is data collected about an individual’s online activities including searches, clicks and browsing patterns. When used correctly, intent data can dramatically boost conversions and sales across all channels. For more information on the importance of using the right signals in your audience strategy we recommend reading, Big Data vs. Small Data: Finding the Data that Matters. 4) What measures does the data provider take to ensure the data is kept private? When has consumer privacy ever been more at the forefront than it is today? Between the increasing occurrences of identity theft and fraud and periodic data breaches…consumer privacy and the protection of it has never been more topical. If you are considering partnering up with a data provider for the management and exchange of data, make sure you feel confident in their privacy policies and guardrails they have in place to secure the data. For our tips on building trust with consumers when it comes to their data, read Six Suggestions for Building Trust with Customers When It Comes to Their Data. 5) How is the data maintained? You’re about to make an important investment in one of the most valuable assets in your marketing strategy…data. Ensuring that it is kept up-to-date and as accurate as possible is crucial to the long-term success of your campaigns. Just as a car requires a tune-up and oil change, data requires a similar ongoing maintenance in order to continue optimizing its performance. Data hygiene is the term used to ready data for effective use. This includes data quality efforts to ensure it is free from errors such as missing, incomplete, incorrect or duplicate records. Data hygiene ensures that data is clean at every stage it is used in. Additionally, data maintenance is critical for audience optimization. Consumer behavior changes over time and when there are changes to engagement and signs of purchase intent shift, audience segments should reflect that in order to deliver the most relevant and accurate segments for your campaigns. In marketing, every dollar counts. Be sure you’re not wasting your marketing spend on outdated data. When speaking with a data provider ask them about their data maintenance process and frequency. We cannot emphasize enough how important the use of data is to your marketing strategy. Entering into a partnership with a data provider is a big decision and one which should be thoroughly vetted. Be sure you are doing your due diligence by understanding where the data is coming from, how it is being created, what the potential trade-offs are for using it and if it’s safe and fresh.